This piece brings together two heavyweights of the period, Liberty & Co and the Ruskin Pottery factory. 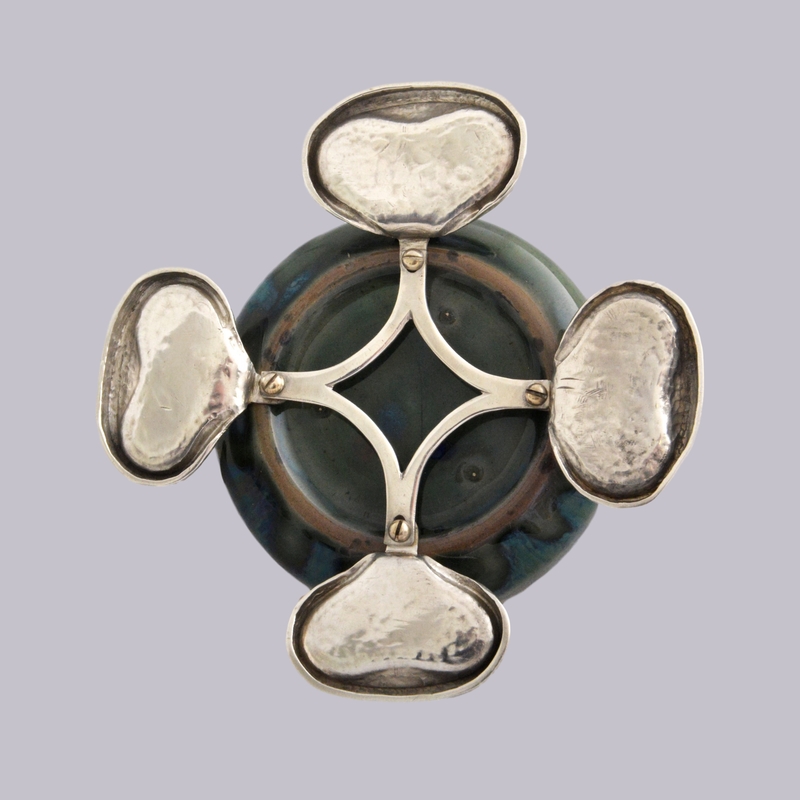 Both innovators and leaders in arts and crafts design in their respective areas. 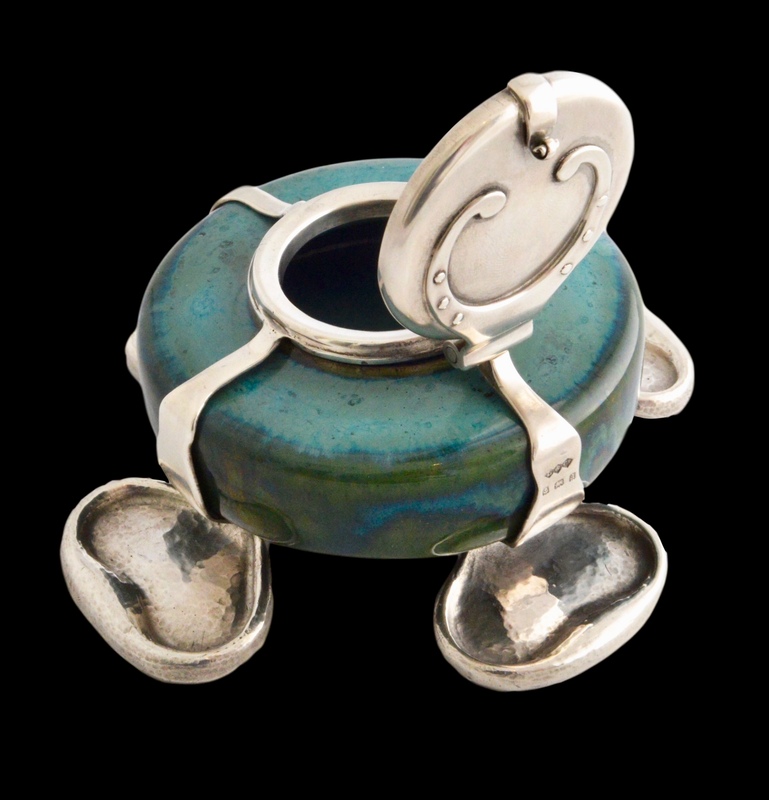 It incorporates a silver mounted souffle glazed Ruskin inkwell (model 60) with a silver lid and surround that “drip” silver to a set of four pools or lilly pad feet. The silver is fully hallmarked for Liberty & Co 1900. The design is classic Oliver Baker and is model 500/69 in the Liberty silver sketch book. 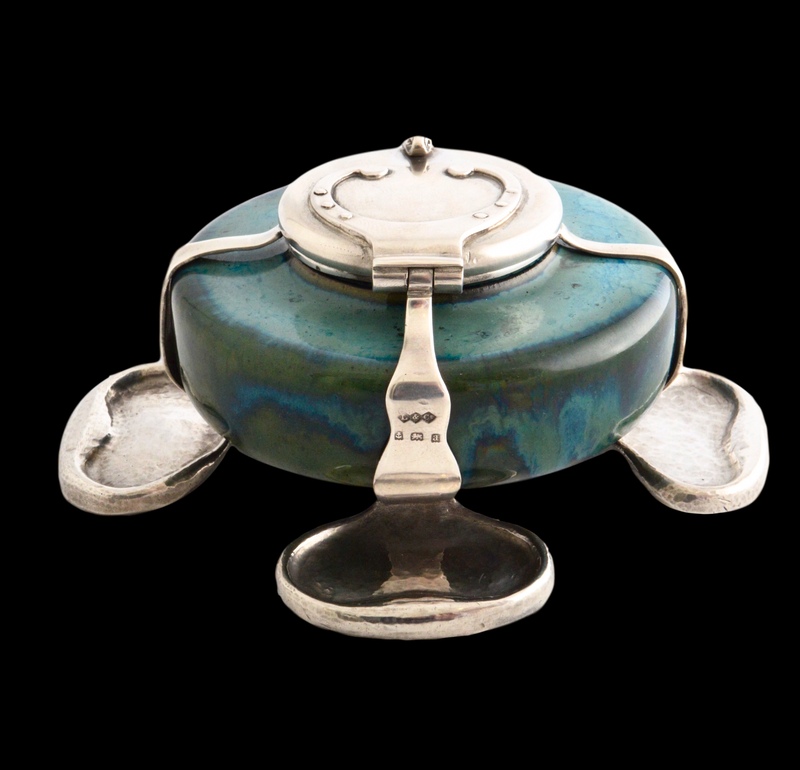 The Ruskin inkwell is made of tocky brown clay and is one of the earliest pieces of Ruskin pottery known, dating from before 1901. The souffle glaze pre dates Ruskins invention of his better know high fired flambe glaze. In its day this would have been a rare and experimental pot which Liberty embellished. The link between Baker and The Ruskin factory, both based in Birmingham, was most likely through William Rabone Haseler, owner of the firm William Hair Haseler who made all Liberty’s Cymric silver. He was also President of The Birmingham School of Art of which Edward Richard Taylor, founder of the Ruskin factory, was headmaster. The Ruskin inkwell is stamp marked with the letters I.B. The inkwell has a hairline crack to the base. The Victoria & Albert Museum has a collection of Ruskin souffle glazed pieces acquired in 1902 and hence also dated to this early period. Further information is available at the website www.ruskinpottery.org, which identifies the Ruskin inkwell as number 60 from c 1900 in the Ruskin range. I am grateful to that site’s owner for his help in researching the Ruskin pottery.